Some construction photos. 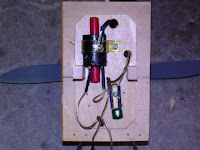 I used Jim O'Reilly and Bruce Augusta plans, plus Bucky Walter modifications. 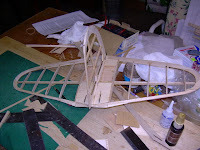 I beefed up the fuselage construction. 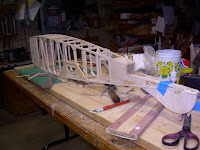 I dropped the fuselage a few time and kept finding broken glue joints. 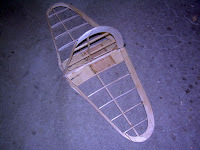 The Old Timers were built to glide to a landing, not dteeing. 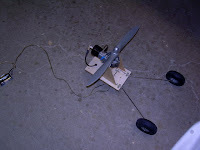 This model should weigh about 2 1/2 pounds, so when it DTees it will drop like a rock. 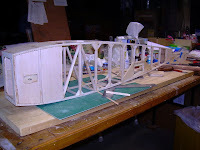 The tail section is beefed up from the original and the nose section along with a rubber band engine mount. Hopefully this will relieve the shock of a hard landing or DT. I found the model to be very nose heavy. 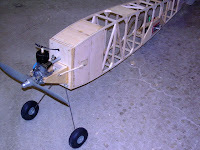 Therefore the battery box is installed in the rear of the fuselage. 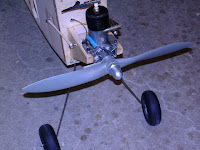 After the battery box was installed the model was still a bit tail heavy; so the Texas Ultimate OT Timer was installed in the rear of the fuselage. The model is still a slight bit nose heavy; I hope the covering and the dope on the rear end of the model will bring into balance. The stab did not want to raise up into the DT position of 50 degrees. It required a lot of rubber bands. 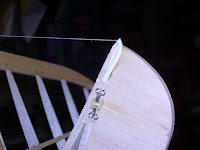 Finally had to straighten the leading edge of the stab, then it popped up with fewer rubber bands. Another problem occurred, the closeness of the timer to the stab would not let me install a stop for the line which attaches to the timer. If you let the line flyoff, it will disconnect from the tension rubber bands and go flying off to who knows where. 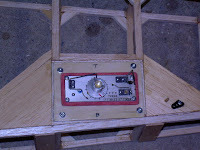 An additional line was connected to the timer line secured to the side of the fuselage near the timer. 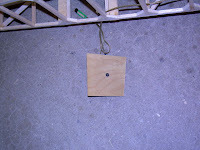 This will prevent the line from flying off the rubber tension hooks. That took a little while to figure out.